The Triumph 5560 Digicut is a 21.5″ (546 mm) programmable hydraulic cutter. 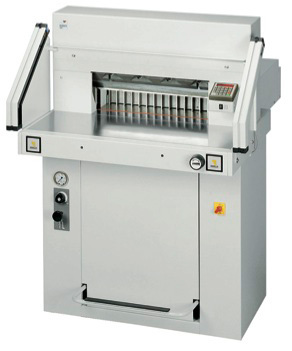 This paper cutter has a program capable of storing up to 99 different programs with up to 99 steps in each program. The digital measuring device is accurate to within 1/100th of an inch. The hydraulic clamp applies even pressure and is adjustable from 1900 and 3,800 PSI. It is equipped with a bright LED optical light line, optional side tables to extend the work area, safety light beams, and a foot pedal for pre-clamping. The cut height is over 3 inches (7.6 mm). Many other guillotine cutter models are available.